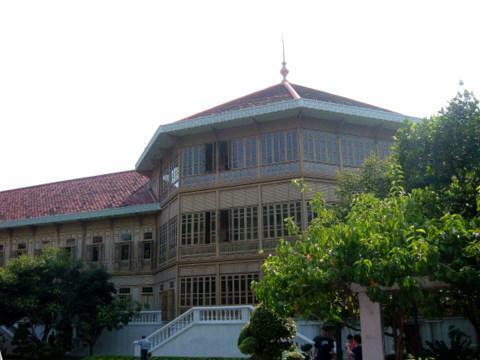 Vimanmek Mansion, built in the reign of King Chulalongkorn or King Rama V as his royal palace, is the largest teak mansion in the world with 22 rooms. The mansion is a raised three story structure with two wings in an 'L' shape. Inspired by his European tour in 1897, King Chulalongkorn decided to establish his new palace in Dusit Garden and to build a royal palace in 1900. The mansion was completed on 27 March 1901 and King Chulalongkorn resided here for five years. The original building was in Si Chang Island in the Gulf of Thailand off the coast of Chonburi. The structure was dismantled, transported to Bangkok and reassembled, in the way of traditional Thai houses, without a single nail! Vimanmek has a checkered history. After King Chulalongkorn's death in 1910, the royal family moved out and the mansion was closed. 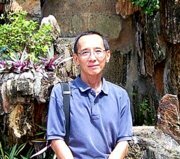 It was reopened briefly during the reign of King Rama VI and closed upon his death. 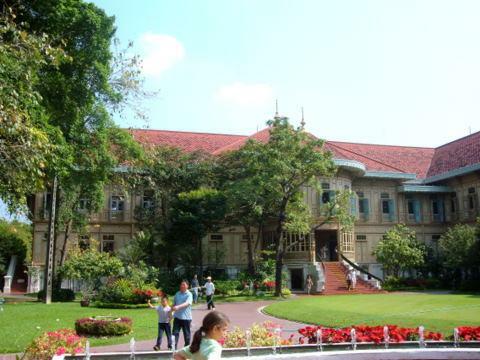 After the 1932 coup, that ended the absolute monarchy in Thailand, the entire Dusit Garden and its royal residential halls came under military administration. Vimanmek Mansion was used as a warehouse for the royal household. In 1982, Her Majesty the Queen with the consent of the King, restored the building to its former glory in dedication to the memory of King Chulalongkorn and to preserve a golden era in Thai history. Vimanmek with its 22 rooms is divided into five sections. The visitor is taken on a fascinating guided tour through the corridors of history from the reception area to the inner court where no other men, except the King and his sons under the age of eighteen, were allowed entry. The rooms have been carefully restored and preserved, almost as if time had stood still: the trophy room where the King, an avid hunter, displayed his hunting trophies; the antique weapons room; the reception area where souvenirs of King Chulalongkorn's European trip are on display. The tour of Vimanmek continues upstairs to the private quarters via the staircase exclusively used by King Chulalongkorn in his reign. The living room upstairs is still used sometimes by the present King to receive royal guests. The other rooms upstairs include the royal private chambers, the library with the largest topaz in the world on display and the working room with the old typewriter still intact. The last leg of the tour passes the grand Throne Room with four thrones, the private chambers of the Queen Consort and the music room. Without the help of the guide, the visitor could easily be lost in the maze of rooms and corridors. Though the architecture of Vimanmek is distinctly Thai, the interior has a mix of European and Chinese décor including some of the finest China and European crystals. 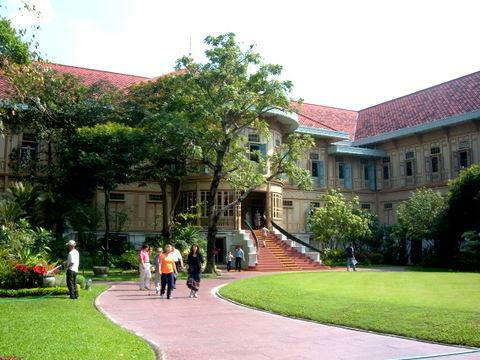 Vimanmek Mansion preserves the legacy of King Chulalongkorn and the heritage of a memorable period in Thai history. The most convenient entrance to use is the north gate at Rajawithi Road. Admission is 100 baht and the ticket includes admission to Dusit Garden and the 13 other Royal Residential Halls each displaying a different aspect of Thai history and culture. Opening hours for Vimanmek Mansion are the same as Dusit Garden; everyday from 09:30 am – 03:15 pm. No photographs are allowed inside the mansion. To get there, please see the Dusit Garden map. To return to Dusit Garden.